I woke up to snow this morning ... but that just means I can stay in and shop this sale! 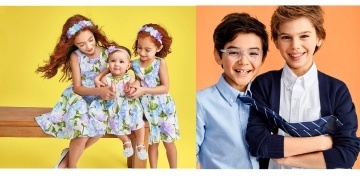 Carter's just launched their Surprise, Surprise event, and select kids' clothes are up to 61% off – but you have to shop soon. This deal is an online exclusive, and they're really clearing things out. I saw tees, leggings and bibs for less than $4 a piece! For example, this Floral Tutu Skirt (in the toddler girl sizes) is half-price, and you can even pick up this sweet blue-and-grey Easter 2-Piece Bunny Bodysuit Set for just $8.99. If you make it to a store today, they have something special on for you, too. Almost everything from the Carter's Dress-Up Shop is half-price! If you shop online, orders over $50 ship free.